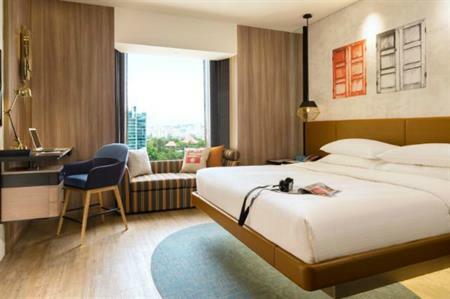 Hotel Jen Tanglin Singapore, formerly Traders Hotel Cuscaden Road, opened in December following a SGD$45mln makeover. The 565 rooms feature four contemporary, locally-curated wallpaper designs highlighting a Singapore theme (bicycle, orchid, goldfish and shop house). The Club Lounge, located on the 17th floor, offers open views of greenery in the nearby residential neighbourhood. For meetings and events, there are 10 function spaces, catering for between 10 to 300 people and the hotel also has a fitness centre, spa and several dining options. Lothar Nessmann, chief operations officer of Hotel Jen, said: "We are thrilled to open the doors to the fresh and renovated Hotel Jen Tanglin Singapore – a pioneering hotel that is fast setting a new benchmark for the Hotel Jen brand." The hotel, operated by Shangri-la Hotels and Resorts, is within walking distance of Orchard Road and 25 minutes from Changi International Airport.